Helsinki – capital of Finland – overlooking the Baltic Sea, just in front of the Estonian capital, Tallinn, which is only 80 km. The city was founded in the sixteenth century by the Swedes under the name of Helsingfors. Helsinki in 1812 became part of the Russian Empire, the city was rebuilt by the Russians to give her the role that competed as capital of the Grand Duchy of Finland. After independence which took place in 1917, were built others important areas of the city, such as the famous Esplandi, an avenue garden full of statues and fountains. The island fortress of Suomenlinna, located in front of the city is a UNESCO World Heritage Site. The market in Helsinki is the largest Christmas market in Finland, the land of Santa Claus. Helsinki Christmas Market (Tuomaan joulumarkkinat). This is the most important Christmas market in Helsinki, made up of nearly 120 stalls, it takes place in the historical Senate Square (Senaatintori) in the heart of Helsinki. The market is full of Finnish handmade crafts, Christmas decorations, desserts and drinks typical of Finland. The selection of vendors is a good range of Finnish delicacies and crafts from all over the country. The selection is a fascinating mix of modern and traditional among both: the food vendors as well as the gifts. The unique visual identity and spatial design of the market have been designed by renowned designer Linda Bergroth. The market attracts visitors from nearly 100 different countries. The Helsinki Christmas Market, the oldest and largest outdoor Christmas market in the city, with lots of fascinating features added every season. This year there will be several amazing restaurants joining the market including restaurant GRÖN which was voted restaurant of the year in 2016. We also have a stage in the heart of the market with plenty of fun performances. A Dutch antique carousel returns to the market once again to delight the younger members of the family, or why not the older ones too and the rides are completely free! 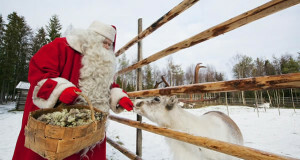 The children may also come and say hello to Santa Claus who is present at his very own market cabin daily. Opening: 1 December – 22 December 2018. Opening Hours: from Monday to Friday from 11 am to 8 pm. On Saturdays and Sundays from 10 am to 7 pm. Helsinki Christmas market (Helsingin Joulumaailma). This Christmas market is held in the city center on the opposite side of the main Stockmann (Mannerheimintie 3) in a pleasant place to shop. Here you will find the traditional wooden houses with gift ideas and Finnish handicrafts including woolen hats, gloves Knitwear, wooden toys, candles and traditional Finnish products. There will also be local gastronomic delights including delicious cheese cakes, toasted almonds, organic jams, fruit juices, hot drinks and typical food. You can meet Santa Claus, snowmen, and other Christmas characters, take a ride on the carousel, see the crib, listening to music and decorate Christmas cookies. Opening: we are waiting for dates 2018. Opening Hours: from Monday to Friday from 11 am to 7 pm; on Saturday from 10 am to 6 pm; Sundays from 12 am to 6 pm. Closed on 24, 25 and 26 December. Women Christmas Fair (Naisten Joulumessut Wanhassa Satamassa). Old Christmas Fair which was held for the first time in 1922, it is a charity fair that offers hand-made items by the elderly and by local women. You will find typical items craft high-quality hand-made from Finnish women, including sweaters, dresses, accessories, jewelry, rugs, pottery, wood and leather, toys, decorations and Christmas cakes. The fair takes place in the old harbor of Helsinki (Wanha Satama). Opening: we are waiting for dates 2018. Opening Hours: from 10 am to 6 pm.